Nikon’s Sensor Formats: FX and DX Nikon’s digital SLR cameras based on its DX-format sensor have been hugely successful and represent an excellent combination of high image quality, size and value. And while the DX-format has been widely accepted by professional photographers and photo enthusiasts around the world, there is an increasing demand among professionals for a digital SLR camera that features higher ISO sensitivity, wider dynamic range and offers the same relationship between picture angle and depth-of-field that were the hallmarks of the 35mm film format.Responding to this demand, Nikon has developed the D3 as its first digital SLR camera that features the Nikon FX-format CMOS sensor to meet the real-world requirements of its professional customers. The D3 delivers full resolution 12.1 megapixel images at up to nine frames per second when used with conventional AF-Nikkor lenses. When used with DX Nikkor lenses, the D3 automatically switches to the DX-format mode that uses a cropped portion of the sensor to generate 5.1 megapixel resolution images. While in this mode, the D3 automatically masks the portion of the viewfinder that will not be photographed and enables the capability to shoot up to 11 frames per second. 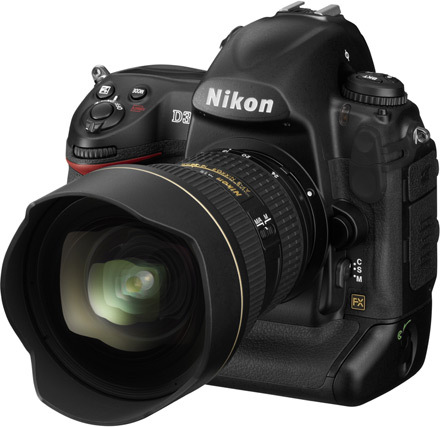 The Most Intelligent Nikon Ever The D3 introduces a range of innovative technologies and features that significantly improve the accuracy, control and performance professional photographers can get from their equipment. Nikon’s exclusive Scene Recognition System advances the use of Nikon’s acclaimed 1,005-segment sensor to recognize colors and light patterns that help the camera determine the subject and the type of scene being photographed, before an image is captured. This information is also used to improve the accuracy of auto focus, auto exposure and auto white balance detection functions in the D3. For example, the camera can track moving subjects better in all directions and by identifying them it can also automatically select focus points faster and with greater accuracy. It can also analyze scene highlights and more accurately determine exposure, as well as infer light sources to deliver more accurate white balance.The D3 incorporates Nikon’s new Multi-CAM 3500FX auto focus module that features an intelligent array of 15 cross-type sensors and 36 horizontal sensors. These sensors can either be used individually or in groups, with the option for Single Area AF mode and Dynamic AF modes using groups of either 9, 21 or all 51 focus points. The system also features 3D Focus Tracking with automatic focus point switching that takes advantage of all 51 AF points as it uses color and light information to accurately track the subject. Nikon’s new Scene Recognition System and improved focus algorithms also contribute to the impressive performance of the new 51-point AF system. The D3 reflects Nikon’s most streamlined, functional and aesthetically pleasing layout in a digital SLR camera, all designed so photographers can take pictures with less fatigue, greater accuracy and comfort.The camera’s viewfinder provides virtually 100 percent coverage for accurate framing, while an ultra-high definition, 920,000-dot VGA LCD screen on the rear of the camera displays images with vivid color and clarity. The 170-degree wide viewing angle makes composing shots using the LCD screen in LiveView mode easy. The D3 also features a unique Virtual Horizon digital level sensor that indicates the camera’s alignment relative to the true horizon on the rear LCD screen or in the viewfinder. Nikon, At the Heart of the Image™. Nikon Inc. is the world leader in digital imaging, precision optics and photo imaging technology and is globally recognized for setting new standards in product design and performance for its award-winning consumer and professional photographic equipment. Nikon Inc. distributes the Nikon Total Imaging System of consumer and professional digital SLR cameras, Nikkor optics, Speedlights and System Accessories; Nikon COOLPIX® compact digital cameras; COOLSCAN® digital film scanners; 35mm film SLR cameras; Nikon software products and Nikon sports and recreational optics. At the heart of every Nikon camera is Nikon’s Exclusive Feature System, making it easy for anyone to take amazing digital pictures. Through the Nikon Spirit Initiative™, the company, plays an active role in supporting aspiring and advanced photographers through a variety of philanthropic organizations, educational programs, events and workshops. For more information, dial (800) NIKON-US or visit www.nikonusa.com, which links all levels of photographers to the web’s most comprehensive photo learning and sharing communities.